Populi is a web-based software program that your school uses to keep academic records (among many other things). We've tried to make Populi simple to learn and easy to use, and it shouldn't take too long to get the hang of it. This article talks about some of the basic stuff you need to use Populi—what you need on your computer, how to use some basic functions—and also links to other articles that dive a little deeper into Populi basics. To use Populi, make sure your computer and internet connection meet these minimum requirements. Sometimes people have trouble using it because something on their computers is out of date or their internet connection isn't fast enough. These requirements aren't anything exotic—basically, a computer with a modern web browser and high-speed internet is all you need! A fast internet connection ensures that you can navigate through Populi quickly and efficiently. If you're out-and-about, a mobile device with a data connection (3G, 4G, or LTE) or your typical coffeeshop wifi connection will usually do the trick. Populi runs on up-to-date releases of popular web browsers. Most web browsers have some sort of auto-update function, so you may never even need to think about this part. And using a modern web browser won't just benefit your Populi use—it's one of the best things you can do for your overall internet security! Here are the browsers we recommend for use with Populi. If a browser is not listed here, don't use it for Populi! Again, always try to use the most recent version possible—as companies release newer versions of browsers, they usually drop support for older versions. Google Chrome is probably the best option if you're using Windows. It's also very good for Mac users. Mozilla Firefox is another good choice on Windows computers (works pretty okay on Macs, too). Apple Safari is great on Macs. Not so much on Windows. Last and certainly least, Internet Explorer. Mac users can't even download it! If you're using Windows 10, they're encouraging you to use Microsoft Edge. iOS Safari does well, as does Google Chrome for iOS. The stock Android browser works, as does Chrome for Android. The Firefox browsers for both iOS and Android aren't problematic. Microsoft Edge (mentioned above) is baked-in to Windows 10 devices and works with Populi; the version of Internet Explorer in Windows 8.1 does alright, too. Open Office can open spreadsheets and documents (we use it to generate files for custom page layouts). Adobe Acrobat reader handles PDFs. If, for some reason, you have to use an old version, the oldest one that works is version 6. Populi is easiest to use if your monitor is set at a minimum resolution of 1280 x 1024 pixels. This is not something most users with a modern computer or monitor need to worry about, but there it is anyway! Populi is designed to keep information secure and confidential. One of the ways it does that is by requiring you to log in with your username and password whenever you use Populi. When you're done using Populi, make sure to log out! Do so by clicking your name in the upper part of the screen and selecting Log Out from the drop-down. This article has all the details about your username and password, including how to change your password and some common-sense security measures. Search is available on every screen of Populi. Use it to locate any person, contact, course, file, etc., that you're allowed to access. Click Search and start typing. Type all or part of your search term. As you type, search will return results grouped by type (people, courses, etc.). Click a search result to go to that page. The search results display until you click elsewhere on the page or click X in the search field. Populi basically works like any other web page. Every page has links or buttons that might perform an action or take you to another page. You can also use your browser's forward, back, and refresh buttons to move among the pages you're working on. 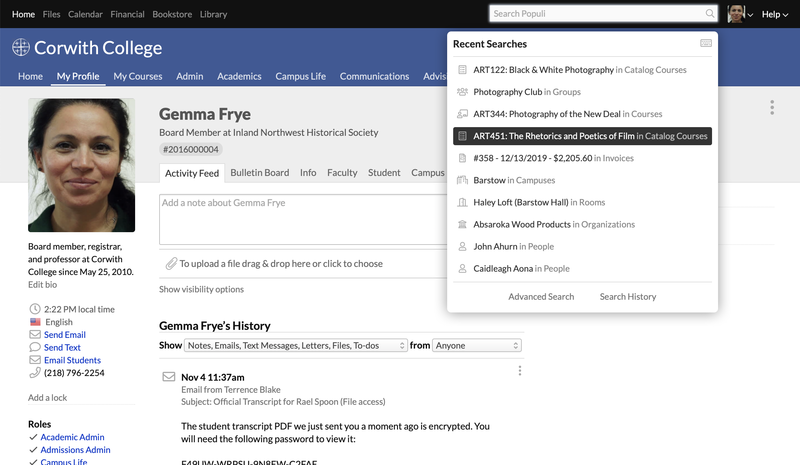 Depending on your level of access and whether your school has enabled certain features, you'll see the high-level navigation app links at the top of the screen: College Management, Calendar, Email, Financial, Bookstore, and Library. Below that are the main navigation views, which change depending on which app you're currently in. These are covered extensively elsewhere in this Knowledge Base. When you log in, you'll go straight to your Populi Home page. Home shows and links to what's going on right now and what's going to happen. Depending on what you have going on, Home might show you Alerts, News, Invitations, Events, To-Dos, and Courses. Click the My Profile view next to Home. Click your name in the top black bar; select My Profile from the drop-down. Click your name wherever you might see it—say, in a report or on a list. Click the Help link in the upper right of the screen. You'll see five help options—click the one you're after. You'll be automatically logged in using your Populi credentials. Go to the support login page. 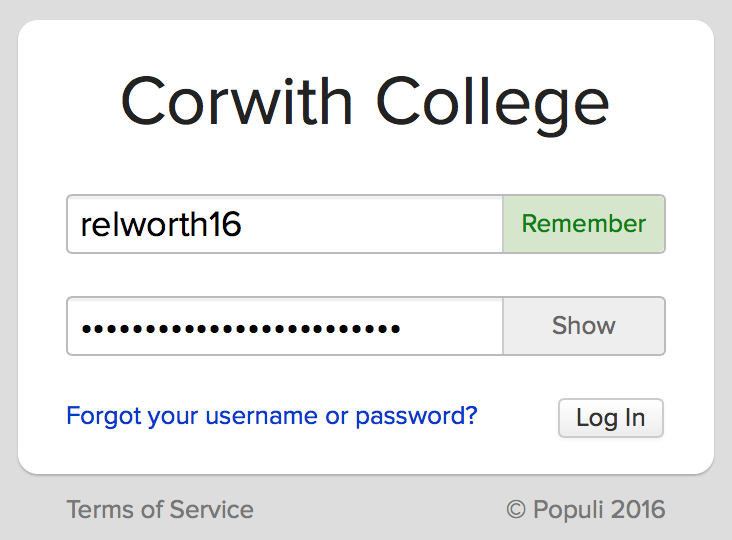 Enter your Populi username and password, and then enter your school's unique Populi abbreviation. You can also read articles without logging in. Start at the Populi Support home page and search for the article you're after. If you're staff or faculty at your school, we recommend subscribing to the User Forum and Release Notes. You can subscribe by going to those links and clicking the Follow button in either forum. When you use Populi, you are subject to the Terms of Service (TOS) and Authorized Use Policy (AUP). These policies govern the relationship between Populi and our customers and individual users. Don't be put off by the stern language in the TOS and AUP—these are legal documents, after all, and they just have to make sure to dot all the i's and cross all the t's. Each document includes some plain-language summaries in the interest of making sure you understand what you're agreeing to. That said, there's really nothing unusual in these documents: they basically say, "We'll provide this service, and you'll use it as much or as little as you like." You can find the TOS and AUP at the bottom of any screen in Populi as well as the Populi website. Your welcome email also includes links to it. In order to log in for the first time, you'll have to indicate your acceptance of the TOS and AUP by checking a box (which is right next to links to both items). The most relevant sections for you as an individual user would be Acceptance, Service Description, General Conditions, and Trademarks. If we ever update the TOS or AUP in any substantive way, we'll inform you ahead of time. If we catch a typo, we'll just update that on-the-fly.